Weather: low 80's, no wind. 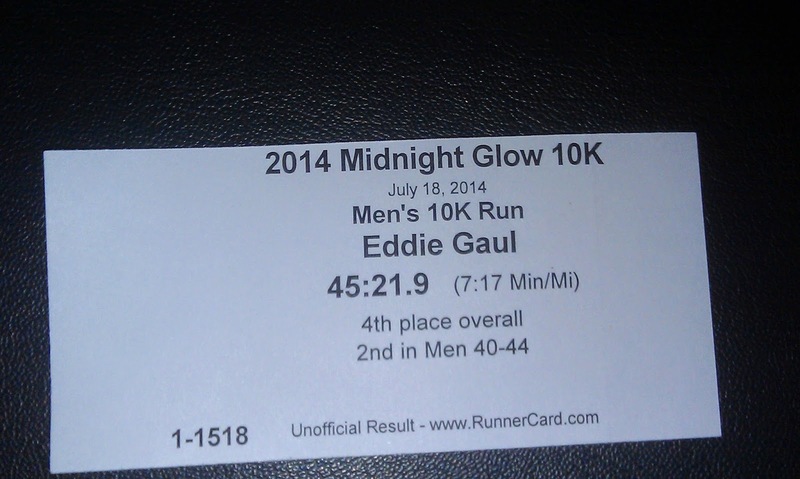 On Friday night I opted to run the Midnight Glow 10K in South Jordan. I really didn't feel like pushing yet another half marathon this weekend, so I went with a low key 10K. 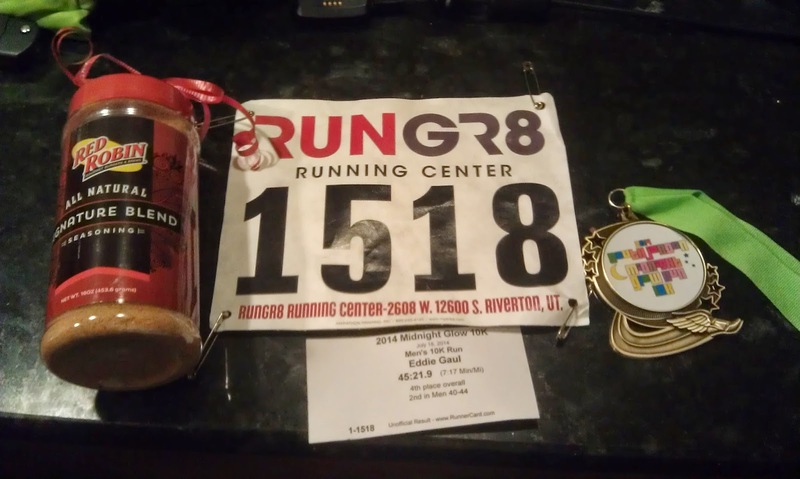 The last 10K I ran was my last day in Illinois where I ran a 45-something at the Harvard 10K. My goal was to hit about 50-something. I honestly think I beat it by a bit. While the course was short, I've punched in my time looking for a race equivalent and it puts me at roughly 48-something. This race was the first annual so the crowd was pretty thin -- I would estimate about 75 runners. Most of them female. I picked up my t-shirt and swag at about 10:45, hung around until the start at 11:30. I started out the race in 4th place, but two guys my age passed me after a third of a mile, but I overtook two females who took off a bit too fast. I wound up holding that position (except for a women who passed me after about two miles into the race (who would eventually win)). I tried like heck to catch the guy's my age and kept them in my sights the entire race. At one point, I calculated I was 20 seconds behind them. The course was held on the Jordan River Bike Trail. It wasn't particularly well lit and the moon wasn't bright but I carried a head lamp, which I used sparingly. I've run the course many times in the past, particularly when I worked at my last job where I'd go to the trail and run south. So I remembered just about every zig and zag in the course. Sadly though this course was well short. 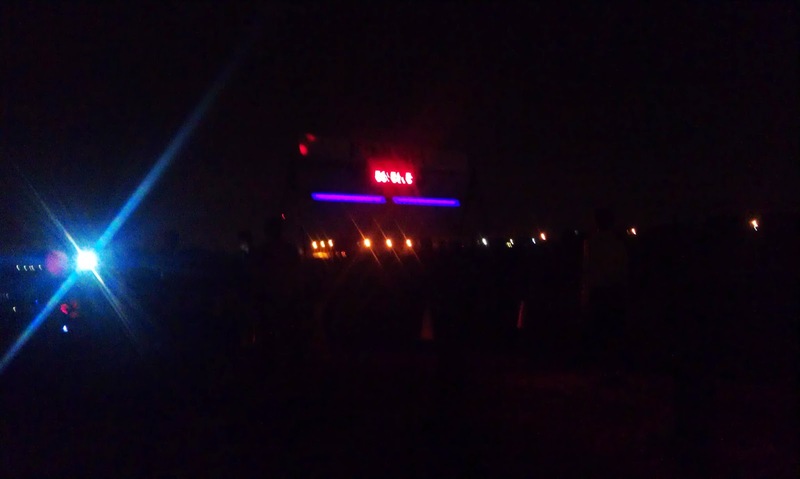 Most people's GPS measured it at around 5.80 something -- well short of the 6.2 miles required for a 10K. The course is supposed to go to a park where from the course map it looks like you run a loop and then head back. Upon arriving at the park the people manning the water station told us to turn around and head back. I took one look at my GPS, which read 2.90 miles and I knew the course was going to come up short. I really worked on stretching my hamstring out and it didn't give me too many fits until about mile 4. It felt tight but it wasn't as bad as it was in the past. I was really hoping to catch up with the two guys my age, but unfortunately I had to hit the bathroom -- bad. It just prevented me from running as fast as I had wanted to. I did catch a bit of a break when I saw #3 guy make a pit stop in the bushes about a third of a mile from the finish line. I thought I'd catch a break and be able to hunt him down, but he saw me and pushed hard to the finish, so I had to settle with 4th overall. I was totally expecting an age group award but sadly they only gave awards to the top 3 finishers. So I was short of winning a gift certificate by about 15 - 20 seconds. I was upset, but still I was happy because I had exceeded my goals. They had a drawing after the race and I won some spices from Red Robin Restaurant as well as some cool coupons which I hope to use. Actually my swag bag was pretty good. 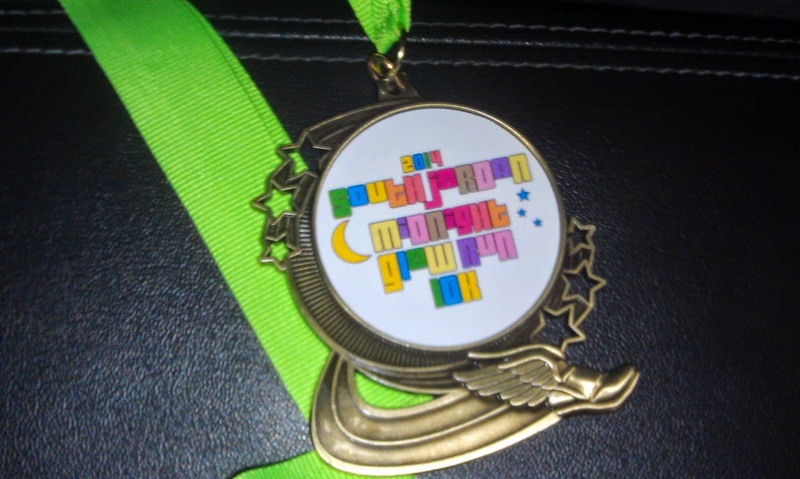 Also, each finisher received a finisher's medal. 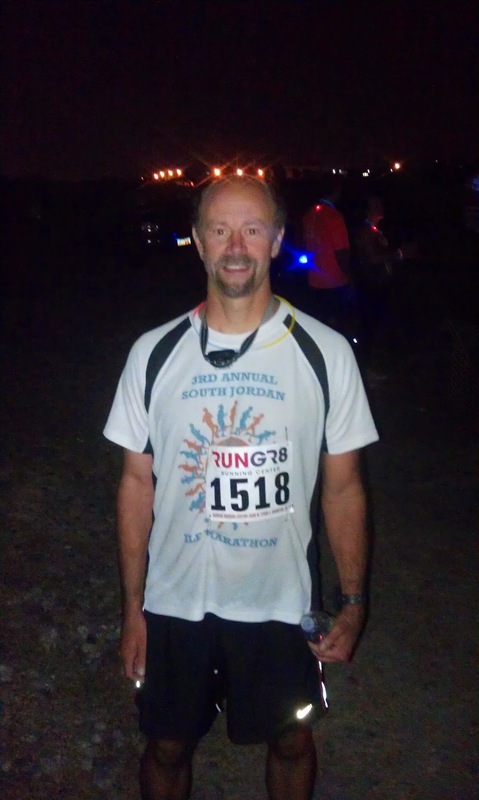 I had a lot of fun at this race and despite the course being short, everyone ran the same race. 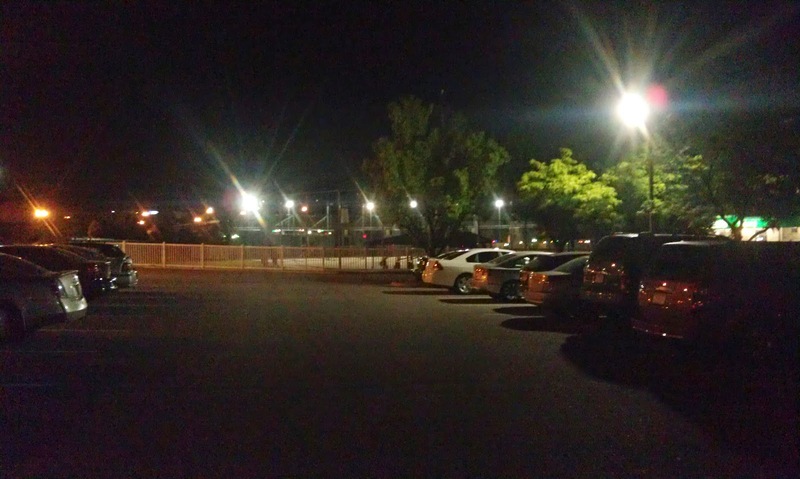 I think there are so many races going on now, that it is hard to generate a large crowd and I suspect in the future there will be some race consolidation. 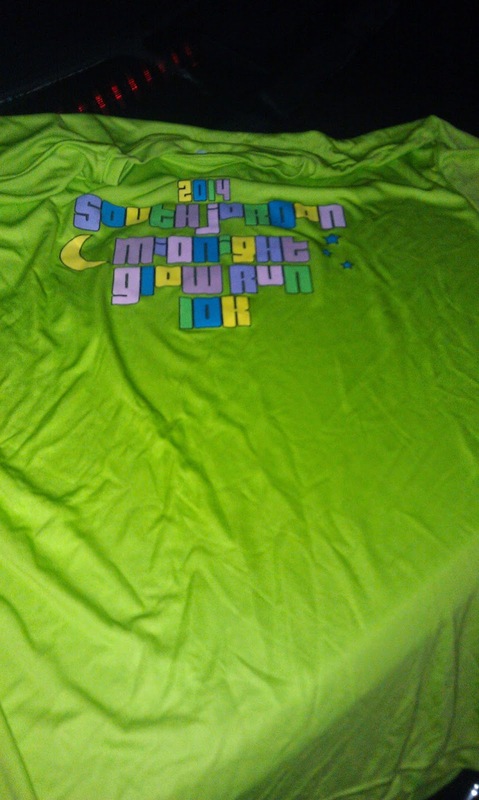 Glow in the dark t-shirt.